Dr. Kevin Wafer was born and raised in Spring, TX. 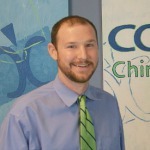 Since his mother worked as a chiropractic assistant, he spent much of his childhood in a chiropractic clinic and was adjusted for the first time at only 3 months of age. He received regular chiropractic care throughout his childhood which enabled him to compete at a high level athletically, playing on numerous All Star baseball teams throughout his childhood. Bailey grew up in Lake Jackson, but moved to Houston in 2014 because "this small town girl wanted to experience the big city!" She loves exploring the city of Houston and finding little gems hidden all over - whether it be restaurants or local shops. "I love Chiropractic because it's holistic and natural. I love that our patients can live a better quality of life due to the benefits of chiropractic care." Erin grew up in Cypress and has a daughter (Aribella) and a cat. She enjoys yoga, cooking, and finding new TV shows with her hubby. "I love Chiropractic because being able to help people feel better and get well without turning to medicine first is so awesome and rewarding. Our office has such a friendly environment - the patients and the staff." Emily grew up in San Antonio and has 2 dogs. She moved to Houston to attend school. She enjoys CrossFit, swimming, cooking, reading, and camping. Emily is a Biology major in hopes of going into plastic surgery. "The results with Chiropractic are fast and noticeable almost instantly. One adjustment helped me with my frequent headaches! My favorite thing about the office is seeing and greeting returning patients. I love the journey and seeing the progress they are making to become pain free!"